This is a single-serving pickle for you to snack on. They recommend serving chilled. If you've ever eaten room-temperature pickles before, you already know why. Lukewarm pickles are weird. It's also weird to suggest "serving" a pickle in a bag. You don't serve this. You eat it. Alone. Just you and the salt. Together at last. When I was a kid, I loved tomatoes because I could pour lots of salt (or soy sauce, which is basically a brown salt-delivery liquid) on them. I don't remember having pickles in rural Brazil at the time. When I discovered pickles, I was all about 'em. It's a vegetable with the salt already in it. Perfection. 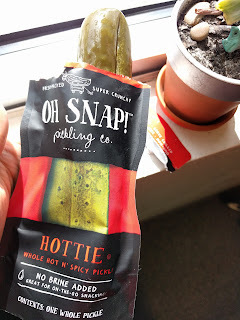 You can send those sweet pickle abominations straight to hell.